An unusual variety of fruit and veg has enjoyed a boost in popularity during 2012's catastrophic growing season – ugly fruit and veg! UK farmers have had to contend with severe drought in early spring followed by the second wettest summer since records began (beaten only by 1912). As well as alternatively parched or sodden earth, crops didn’t have enough light to thrive in the dark early summer. Here at New Covent Garden Market, traders are well used to reacting fast to these changes in supply and demand, and have been following this year's weather and harvest very closely. 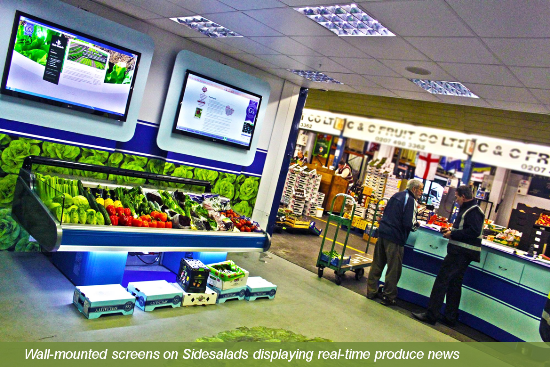 Sidesalads in Buyers' Walk have taken this one step further and recently installed screens to show real-time conditions in the field. This gives buyers instant visual evidence of the factors affecting supply and prices. Choice is key when certain products are short: if potatoes are expensive, try wonderful squash instead! English Apples and Pears have launched a campaign called Still Tastes Great to reassure buyers that whilst they might not be cosmetically perfect, this season's top fruit is still a delight to eat. It's not all bad news as supermarkets have relaxed rules on 'ugly' and small produce so more of the poor harvest can be sold. Remember, always talk to your supplier about which products are in short supply and which are plentiful as this will affect price, and check http://www.newcoventgardenmarket.com/blogs for our monthly Market Report.